16.7 Protesters with swords screamed, "Kill Her! Kill Her!" "Sura 8.12 When your Lord revealed to the angels: I am with you, therefore make firm those who believe. I will cast terror into the hearts of those who disbelieve. Therefore strike off their heads and strike off every fingertip of them." A 54 year old British primary school teacher has been arrested in Sudan accused of insulting Islam's prophet by allowing her class of 7 year olds to name a teddy bear Mohammed. Gillian Gibbons could face several months in jail if she's convicted of blasphemy under Sudanese law. Amber Henshaw has more. Gillian Gibbons' colleagues at Unity High School in the Sudanese capital said they feared for her safety. They said there were reports that young men had already started gathering outside the Khartoum police station where she's being held. The 54 year old primary teacher was arrested at her house in the school compound on Sunday afternoon. State media said she was being charged with blasphemy after allowing her class of 6 and 7 year olds to choose their favourite name for a teddy bear they were using as part of a school project. The pupils voted to call the cuddly toy Mohammed. The school said Miss Gibbons had been following a British educational course designed to teach the children about animals and their habitats. She was taken into custody after complaints to the Ministry of Education. Unity High School's director, Robert Bulos, insisted that the teacher had made an innocent mistake but he said he was concerned it could have serious consequences. As a result the school has decided to close until January. 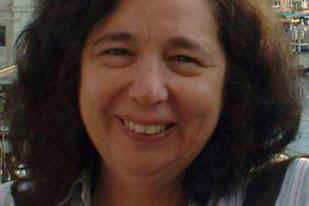 British Embassy officials in Khartoum are visiting Gillian Gibbons in custody. A British schoolteacher in Sudan may face blasphemy charges for insulting Islam's Prophet after letting her pupils name a teddy bear Muhammad.If she is convicted, the punishment could be six months in jail, 40 lashes or a fine. A seven-year-old Sudanese boy has defended his British teacher, who stands accused of insulting Islam's prophet, saying that he had suggested calling the class teddy bear Muhammad because it was his own name. Police arrested Gillian Gibbons, 54, on Sunday after complaints by parents that she had acted blasphemously in allowing the toy to be called Muhammad. Gibbons, a teacher at the exclusive British-style Unity high school in Khartoum, had asked her pupils to name the bear as part of a project to teach them about animals and their habitats. "The teacher asked me what I wanted to call the teddy," the boy told Reuters. "I said Muhammad. I named it after my name." His suggestion was put to a class vote and was the clear winner. The boy, who said he was not thinking about the prophet when he put forward his choice, described Gibbons as "very nice". Gibbons, who is from Liverpool, spent her third night in jail yesterday, as she was moved from a local police station to a bigger police office in Khartoum north, where she is waiting to be charged. She has retained a local lawyer, but embassy officials were prevented from seeing her yesterday. "She is still in detention and the investigation appears to be ongoing," said a British embassy spokesman in Khartoum. "We visited her on Monday and we hope to be allowed to see her again tomorrow morning." Gordon Brown said yesterday that he felt "very sorry for what has happened to Miss Gibbons", and that every effort was being made to ensure a speedy release. The Muslim Council of Britain also condemned the arrest, saying it was "obvious that no malice was intended". The Sudanese government is insisting the law follow its course. Mohamed al-Mardhi, the justice minister, told local media that he had ordered the country's general prosecutor to take charge of the case. 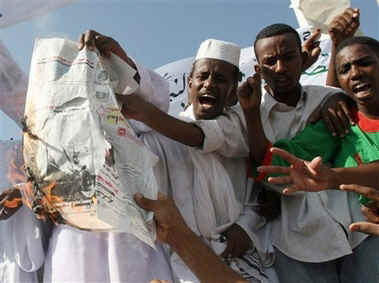 "[The charges] are under the Sudanese penal code ... insulting religion and provoking the feeling of Muslims," he said. The offence carries a penalty of six months in jail or 40 lashes. The teddy bear incident occurred in September, a month after Gibbons arrived in Sudan, but it was not until last week that Unity's director was informed that a few parents had complained to the Ministry of Education that their religion had been insulted. For devout Muslims, any depiction of the prophet Muhammad is regarded as blasphemous. The school is closed until January, for fear of reprisals. The feeling among most teachers and parents at Unity - Muslim and non-Muslim - is that the Sudanese authorities have overreacted. "I'm annoyed ... that this has escalated in this way," Muhammad's mother said. "If it happened as Muhammad said, there is no problem here - it was not intended." An English mother, who had a child in one of the other classes in Unity, said: "I was just gobsmacked. And when I talked about it to colleagues who were Muslims, they felt the same. They were amazed. "When I first heard about the teddy bear I thought 'Oh no, don't go down that road. That's a really bad idea.' But she had just arrived in Sudan. She must have been idealistic, full of new ideas. She just didn't realise that it was such a problem." Even the Sudanese embassy in London called it a "storm in a teacup". Khalid al-Mubarak, the embassy spokesman, told the BBC he expected the case would be treated as a "minute complaint", and that cultural differences had caused the problem. charged with insulting Islam and inciting religious hatred after it emerged that she allowed children to name a teddy bear Mohammed. Abdel Daim Zamrawi, Sudan's deputy justice minister, told the official SUNA news agency that Gillian Gibbons had been charged with the offences on Wednesday. "The punishment for this is jail, a fine and lashes. It is up to the judge to determine the sentence," Zamrawi was quoted as saying. Britain said that it was summoning Sudan's ambassador in London to its foreign office after learning of the charges. Gibbons has been in custody for three days since parents complained that she had allowed pupils at the private Unity High school to name the bear Mohammed. She allowed boys and girls as young as six to name the bear Mohammed several months ago. Officials at the Christian-run school say the bear was named after a vote by the pupils. For devout Muslims, any physical depiction of Mohammed is considered blasphemous. Gibbons faces up to six months in jail, 40 lashes and a fine if she is found guilty of "insulting or degrading any religion, its rites, beliefs and sacred items or humiliating its believers", as stipulated in Sudan's penal code. Some Islamic leaders in Sudan said on Wednesday that the law should be applied against Gibbons. 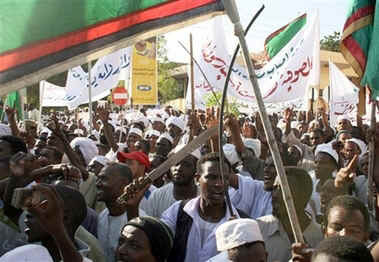 North Sudan's legal system is based on Sharia, which punishes blasphemy against Prophet Muhammad. "What has happened was not haphazard or carried out of ignorance, but rather a calculated action and another ring in the circles of plotting against Islam," the Sudanese Assembly of the Ulemas said in a statement. The office of Gordon Brown, Britain's prime minister, said David Miliband, the country's foreign minister, wanted to see the Sudanese ambassador "as a matter of urgency". The purpose of the meeting was "so we can get a clear explanation for the rationale behind the charges and a sense of what the next steps might be", a spokesman for the prime minister's office said. Gibbons told British consular officials who visited her in Khartoum on Wednesday that she was being treated well by the authorities. "Our consulate went to visit her this morning. She said she was okay and treated well," an embassy spokesman said. Zamrawi said Gibbons was being treated humanely. "She is in a room and she has all the necessary things. She has seen her lawyer and is brought food," he said. "She has basic rights. For us, she is innocent until her guilt has been proved ... Her relatives can visit her." He said the authorities were working to ensure that Gibbon would not be exposed to angry mobs should she be released. Sudan's education ministry will conduct an inquiry into the school to determine whether it had sought to cover-up the incident, Zamrawi said. A British schoolteacher in Sudan has been charged with blasphemy for insulting Islam's Prophet after letting her pupils name a teddy bear Muhammad. If convicted, the punishment could be six months in jail, 40 lashes or a fine. BBC News website readers, as well as readers of BBCArabic.com, have been sending their reaction to this story. My 12-year-old son goes to the same school where Ms Gibbons is a teacher. The culture here, as elsewhere in the Islamic world, is very sensitive. That's why the story took such a direction. Maybe she didn't mean this to happen and it was an innocent mistake. But they don't accept that as an excuse. Lashes is a severe punishment and it is too harsh for what she did. But she has to be punished somehow. She should have learnt more about this society and taken more care about her actions. Me and other parents are not happy about the school closure. The children are going to miss so many classes and they were supposed to have exams next week. Now they have to stay at home and wait. I've been a student at the Unity High School for the last seven years. I am really worried about Miss Gillian. I don't know her because she teaches the younger schoolchildren, but I always see her playing with the kids and making them feel happy. She seems to be a wonderful teacher. I am a Muslim but I am not offended by what she did. She had no idea that it is forbidden. She should be freed. I believe this was a misunderstanding and the authorities are sensitive in light of the recent cartoon fiasco in Europe. I think it will be resolved and Miss Gibbons will eventually be cleared and allowed to go home. But it highlights how sensitive and defensive people have become. I pray it is all resolved soon and Ms Gibbions is allowed home. To feel offended by what the teacher did is impossible. She should not be punished for something like that. I believe that the teacher is in her right mind and is aware that she is in an Islamic country. I am sure she knows what can create religious tension and she wouldn't have done such a thing on purpose. The poor lady is being accused of a sin she did not commit. I hope and pray that the UK government will take this seriously and intervene with vigour before things get out of hand. Why aren't Muslim brothers taking more kindly to such things? Sanity my people! I was at the Unity High School when the event took place. I am a student there. I think it was a misunderstanding. I feel sorry for the teacher, sadly she lacked common sense. I am supporting Miss Gillian and I hope she can be free soon. I'm a Muslim and I find it ridiculous that such a harmless incident could incite such hatred. Where is the common sense? There are people called Muhammad who behave worse than animals and yet we have to imprison a teacher for choosing this name for a teddy bear. Simply outrageous. From BBCArabic.com: Why did she choose this name in particular? 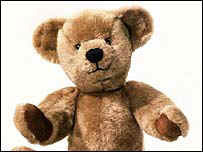 There are many other names for these toy bears and children's TV shows are full of them. It is actually an insult to Prophet Mohammed. I was born in Sudan. I moved to the UK two years ago. The teacher went to Sudan and she should have learnt the laws of that country. Here in England people think that what she did was an innocent mistake, but I don't think that. She was very wrong to make fun of the Prophet Muhammad. Boys are called Muhammad and that's alright because mothers are proud to name their sons after the Prophet. But to name a teddy bear after him is wrong. The teacher should be punished because she has insulted Islam and Muslim people. It looks unintentional. Therefore the teacher shouldn't be punished. However, as a teacher she should be more careful and be thoroughly aware about other faiths in a multi-ethnic, multi-religious global environment. What would the teacher's reaction be if one of the students suggested the name Jesus? From BBCArabic.com: Muhammad is a very common name for Muslims. If we are to punish this teacher for calling a teddy bear Mohammad, then we should punish criminals for being called Mohammad. The truth is that these failed regimes want to keep people busy with these trivial matters. Sudan has enough problems already. How would Sudan feel if European countries deported Sudanese citizens as a response to this action? Speaking as a father I do not feel this was a well thought out plan by the teacher. However, I feel that she has done nothing wrong. The children themselves should be punished for having chosen the name of our great Prophet for a lowly bear. The teacher was misguided, whereas the children were malicious. They must be brought to answer for their blasphemy. This is absolutely insane. I could understand if it was meant as a malicious attack, but it is obvious that this is far from that. It was a simple mistake made by a foreigner in that country. There are many social and cultural mistake that foreigners make in the UK. I hope that they realise soon and release this woman. From BBCArabic.com: It was an unintentional mistake on her part to call the toy Mohammad. The children voted as well. They should lock them up too, as a lesson to anybody who insults Prophet Muhammad. As a committed Muslim who would always hope to uphold the dignity of Prophet Muhammad, I am outraged by the ignorance of the Sudanese authorities. The name Muhammad is given to others and is not exclusive to the Prophet, therefore why should they think the teacher intended the toy to be an effigy? While it is not befitting to give an animal this beautiful name, any half-witted person can see that this was done with good intention. The idea of hardline rules and punishments for such trivial issues is in no way a reflection of the true Islamic teaching and I expected better from Sudan. I believe it makes a mockery of the traditionally upright and just Islamic law system. I hope the school teacher will be freed at once and apologised to. From BBCArabic.com: This incident shows how some people insist on insulting Prophet Mohammed in spite of the fact that they know that Muslims respect and venerate him. This teacher lives in a Muslim country and surely she knows how Muslims feel about the Prophet. This is unbelievable. I'm fed up of reading and hearing stupid incidents like these, which further enhance the incorrect portrayal of Islam. The teacher has quite clearly made an innocent mistake. Islam is about tolerance and forgiveness. The possible repercussions of this incident contradict this entirely. It provides more fuel for the anti-Muslim sentiment around the world. It is ludicrous that Sudanese officials found the actions of this teacher offensive to their religion. By no means did she try to create a visual image of Prophet Muhammad, especially as the visual aid was in fact a harmless stuffed teddy bear. Since visual representation of the Prophet is considered blasphemous, then shouldn't all those Muslim men who are named after the Prophet change their names? From BBCArabic.com: The fact that she is English and lives in an Arab country makes her aware of our traditions and values. The English in particular know a lot about us and are respectful in their dealings in Arab countries. I think that if any action is to be taken, it should be to deport her and ask for an official clarification of what she meant by her action. I am a Muslim, and I must say that the interpretation of the rules has gone too far. I can only expect that the teacher wanted to respect the children's honour of the Prophet by naming the teddy bear after him. It is a popular name. Every other boy in Malaysia has Muhammad as part of his name. I don't think that she intentionally tried to offend the Prophet. Children have a tendency to name favourite objects with their favourite names and, if anything, parents should feel rather proud that their children find the name Muhammad so dear to them. This ridiculous interpretation of Islamic rules should be stopped. From BBCArabic.com: My name is Mohammed. 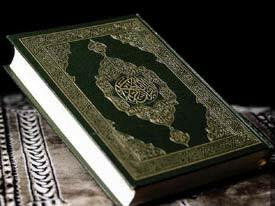 Should my parents be tried for insulting Islam? British teacher Gillian Gibbons, 54, from Liverpool, has been sentenced to 15 days in prison in Sudan after she allowed her pupils to call a teddy bear Muhammad. Politicians and religious leaders gave their response to the court's decision. "This case should have required only simple common sense to resolve. It is unfortunate that the Sudanese authorities were found wanting in this most basic of qualities. They grossly overreacted in this sad affair. Gillian should never have been arrested, let alone charged and convicted of committing a crime. We hope that Gillian will be able to return home without much further delay. " " Obviously relief that there won't be the public lashing which everybody feared, but deep disappointment because this was clearly a mistake and I know that the Muslim community here in Liverpool will be as disappointed as anybody. I think, too, a real anxiety that something like this so badly handled in this way [and] won't do anything to build up good relations between the faith communities. " " What was an innocent error escalated into a charge, and a charge of which she's now been found guilty. The fear was that this wasn't seen as an individual issue but as something that could get bound up in international politics." " The sentence is a mockery of justice and Amnesty International consider Gillian to be a prisoner of conscience. She should be immediately and unconditionally released. " " There was no intent on her part. A number of people have come forward and made that very clear, both in Sudan and here, that at worst it was just a misunderstanding based on naivety, but even so that a number of her colleagues at the time saw very little wrong, or very little that was likely to cause any offence, in terms of the naming of the bear. So I think she is not someone who has sought to cause offence, she's not someone who's acted foolishly, but she perhaps hasn't necessarily understood the extent to which some of the parents might have been sensitive to the use of this name. KHARTOUM, Sudan (CNN) -- Hundreds of angry protesters, some waving ceremonial swords from trucks equipped with loud speakers, gathered Friday outside the presidential palace to denounce a teacher whose class named a teddy bear "Mohammed" -- some calling for her execution. Protesters in Sudan vent anger against British teacher Gillian Gibbons. The protesters, which witnesses said numbered close to 1,000, swore to fight in the name of their prophet. 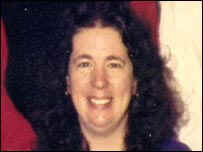 Gillian Gibbons, 54, was given 15 days in jail late Thursday after she was convicted of insulting religion. She was cleared of charges of inciting hatred and showing contempt for religious beliefs, her lawyer, Ali Ajeb, said. Ajeb said they planned to appeal the sentence, which begins from the date she was detained, Nov. 25. Including Friday, she has 10 more days in jail. British Foreign Secretary David Miliband said he was "extremely disappointed" that the charges were not dismissed. Meanwhile senior British lawmakers were en route to Khartoum to try to secure Gibbons' early release. The two members of the House of Lords were set to arrive in Khartoum about 5 a.m. Saturday (9 p.m. Friday ET), Time magazine reporter Sam Dealey told CNN, citing British and Sudanese sources. They will meet with government ministers and Sudanese President Omar al-Bashir, he said. Sources close to the British government and the Republican Palace in Sudan say it is expected that a deal will be reached, and Gibbons will be released, Dealey said. Visas for the two, he said, were granted "in record time ... by Sudanese standards." Friday's demonstrations began as worshippers spilled out of mosques in the capital after Friday prayers. They marched to the palace, which is on the same street as Unity High School, where Gibbons taught grade school students. Those who named the bear were 7 years old. A heavy police presence was maintained outside the school, but no demonstrators were there. Armed with swords and sticks, the protesters shouted: "By soul, by blood, I will fight for the Prophet Mohammad. Western journalists who attempted to talk to the protesters were ushered away by men in plain clothes. Gibbons is being held in a women's prison in the Omdurman district of Khartoum, and she will be deported at the end of her prison term, British consular officials told CNN. British Embassy staff said they were giving the teacher -- from the northern British city of Liverpool -- full consular assistance. In leaflets distributed earlier this week by Muslim groups, the protesters promised a "popular release of anger" at Friday's protests. The leaflets condemned Gibbons as an "infidel" and accused her of "the pollution of children's mentality" by her actions. Omer Mohammed Ahmed Siddig, the Sudanese ambassador to Britain, was summoned for a second time to meet with the British foreign secretary late Thursday after the court's ruling. Miliband also spoke to the Sudanese acting foreign minister for 15 minutes on the telephone during the meeting, the British Foreign Office said. "Our priority now is to ensure Ms. Gibbons' welfare and we will continue to provide consular assistance to her," Miliband said in a statement. The Foreign Office said there would be further talks with the Sudanese government Friday. Gibbons was arrested Sunday after she asked her class to name the stuffed animal as part of a school project, the Foreign Office said. She had faced charges under Article 125 of Sudan's constitution, the law relating to insulting religion and inciting hatred. She could have received a sentence of 40 lashes, a fine or jail term of up to a year, according to the Foreign Office. British newspapers condemned Gibbons' conviction, with the Daily Telegraph calling for the recall of the British ambassador from Khartoum and sanctions against the heads of the Sudanese government. In an editorial, the tabloid newspaper, The Sun, said Gibbons' jailing was a "grotesque insult to Islam" and called Gibbons "an innocent abroad." Four vans filled with riot police were waiting outside the courthouse at Thursday's hearing, but there were no disturbances. Staff from Gibbons' school, including director Robert Boulos, were present. Defense counsel later confirmed that the complaint against Gibbons came from Sarah Khawad, a secretary at the school. Gibbons has been working at the school, popular with wealthy Sudanese and expatriates, since August, after leaving her position as deputy head teacher at a primary school in Liverpool this summer, Boulos said. NAIROBI, Kenya, Nov. 30 ? Hundreds of demonstrators in Khartoum, Sudan?s capital, poured into the streets on Friday demanding the execution of a British teacher who was convicted of insulting Islam because her class of 7-year-olds named a teddy bear Muhammad. Protesters in Khartoum today demanded the execution of a teacher convicted of insulting Islam after her students named a teddy bear ?Muhammad.? The protesters, some carrying swords, screamed, ?Shame, shame on the U.K.!? and, ?Kill her, kill her by firing squad.? They were calling for the death of Gillian Gibbons, the teacher who was sentenced Thursday to 15 days in jail. Under Sudanese law, she could have spent six months behind bars and received 40 lashes. Despite the display of outrage, witnesses said that many of the protesters were government employees ordered to demonstrate, and that aside from a large gathering outside the presidential palace, most of Khartoum was quiet. Imams across the city brought up the case in sermons after Friday Prayer, but few of them urged violence. ?This woman gave an idol the name of Muhammad, which is not acceptable,? said Ahmed Muhammad, the imam at a mosque in Khartoum 2, an upscale section of town. But, he added, the proper response was more nuanced: ?We have to first respect ourselves, and then others will respect us.? In Islam, insulting the Prophet Muhammad is a grave offense, and worshiping idols is prohibited. British officials said they were pressing the Sudanese authorities to let Ms. Gibbons, 54, out of jail early, and they played down the protests. ?The protesters went right past the embassy, but it was kept under control,? said Omar Daair, a spokesman for the British Embassy in Khartoum. ?There was lots of police and security.? Mr. Daair said British officials paid a visit to Ms. Gibbons in jail on Friday morning. ?She?s fine,? he said. The events that led to the furor began in September when Ms. Gibbons, who taught at one of Sudan?s most exclusive private schools, opened a project on animals and asked her class to suggest a name for a teddy bear. The class voted resoundingly for Muhammad, one of the most common names in the Muslim world. As part of the exercise, Ms. Gibbons told her pupils to take the bear home, photograph it and write a diary entry about it. The entries were collected in a book, ?My Name Is Muhammad.? The government said that when some parents saw the book, they complained to the authorities. On Sunday, Ms. Gibbons was arrested. Several Muslim clerics in Sudan called for her to be whipped, while British diplomats said that she had made an innocent mistake and that she should be cleared. Ms. Gibbons went to trial on Thursday, and after an all-day proceeding, the judge seemed to reach for a compromise by finding her guilty of insulting Islam but handing her a relatively light sentence. The government said she would be deported as soon as she was released. It seems that Ms. Gibbons and the teddy bear became enmeshed in the larger struggle between the Sudanese government, which routinely accuses its Western critics of being anti-Islamic, and European and American officials pressing for an end to the crisis in Darfur. In early November, Sudanese officials said that peacekeepers from Scandinavia could not serve in Darfur, the troubled region of western Sudan, because of a dispute two years ago, when several Scandinavian newspapers published caricatures of the Prophet Muhammad. United Nations officials have said that the Sudanese government was simply looking for ways to block or delay the deployment of an expanded peacekeeping force. This week, United Nations officials said that unless the Sudanese government started cooperating, the expanded mission might not be possible. Izzadine Abdul Rasoul Muhammad contributed reporting from Khartoum, Sudan. She left Sudan on an Emirates flight to London via Dubai hours after the courts ruled she should be deported after completing her sentence. Watch how diplomats worked to defuse the crisis ? "It's been a strange old week, very strange for the family, and we're pleased it's coming to an end," he added. Watch John Gibbons' happy reaction ? On Friday, hundreds of protesters, some waving ceremonial swords from trucks equipped with loudspeakers, gathered outside the presidential palace to denounce Gibbons. Watch protesters call for Gibbons' execution ?